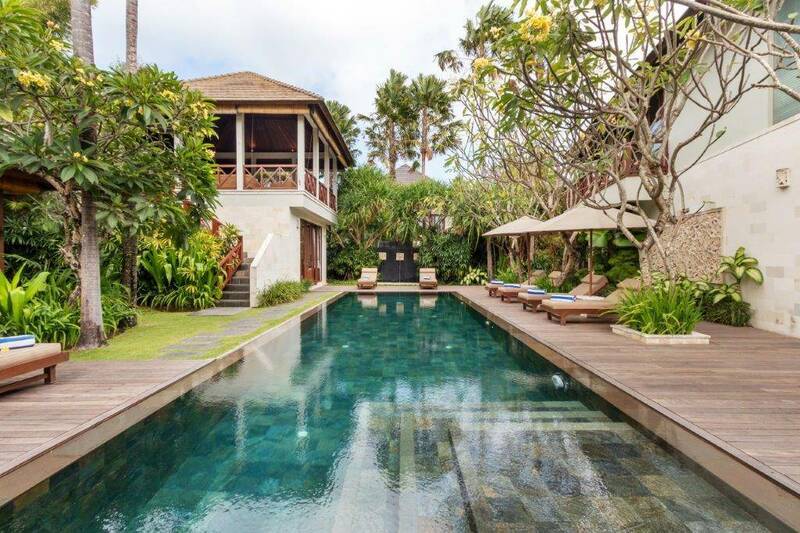 Perfectly situated 100 metres from Batubelig Beach in Greater Seminyak, 30 minutes from the airport and minutes from the boutiques, restaurants and nightlife that make Seminyak so appealing, the elegant Villa Joss embraces all the comforts and glamour of modern tropical living while preserving an exotic atmosphere and distinctive Balinese charm. 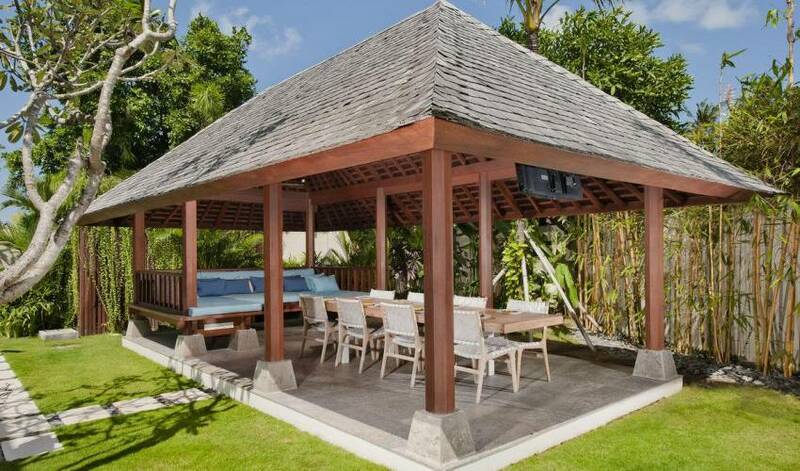 Designed by one of Bali’s premier architects, the quality of the design and craftsmanship is evident throughout this four-bedroom villa, making ample use of leather, recycled teak and other beautiful organic materials, as well as a remarkable collection of fine art and Majapahit period stone carvings, to capture the style and spirit of Bali. 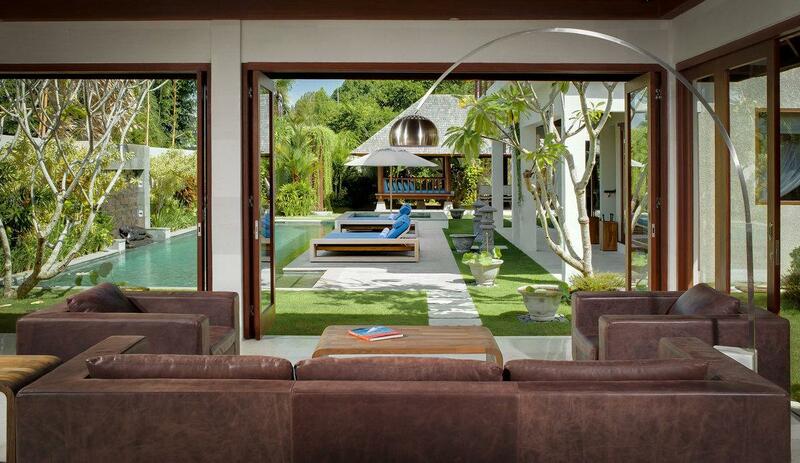 Completed in August 2010, the contemporary Balinese architecture of Villa Joss features a living room and dining room pavilion, a four bedroom pavilion, an entertainment room and business centre, and an open air 'bale' lounge pavilion in the spacious gardens with a 16-metre swimming pool and outdoor Jacuzzi. 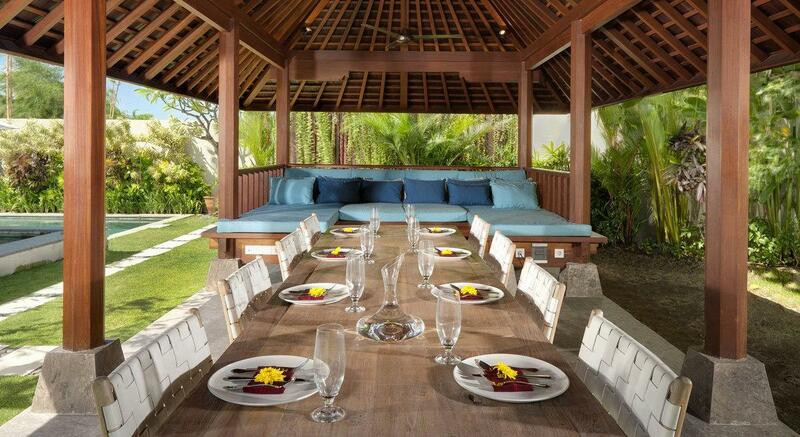 The architect's other work can be seen in some of Seminyak's finest venues including Ku De Ta. The villa is named after the owner's daughter. 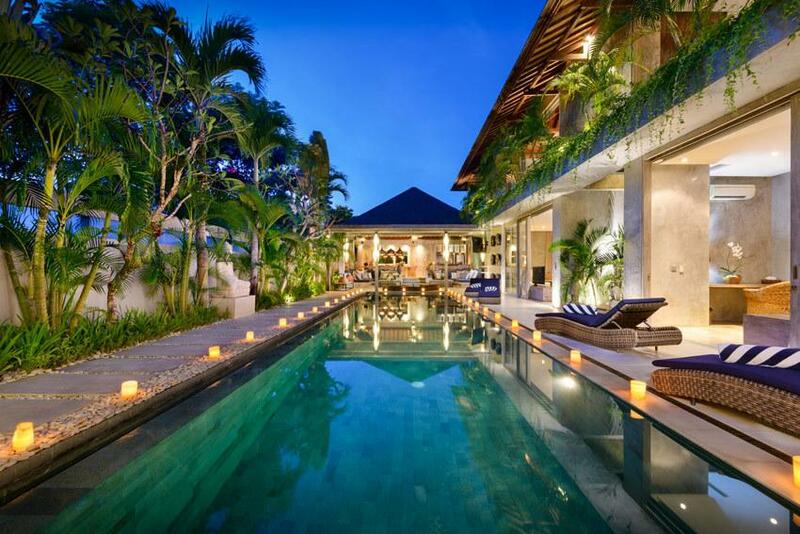 The fine art traditions of Bali have been highlighted with care in this villa. Upon entering the main gate, guests are greeted by a stone relief carving of Balinese Gamelan musicians which dates back to the Majapahit Kingdom's retreat from Java to Bali in the 1500's. The original carving is found in one of Bali's oldest temples, Pura Dalem in Desa Singepadu Tengah, and was reproduced at the villa by a family of artisans from Batu Bulan, the most famous stone-carving village in Bali. The gorgeous entrance to the villa involves a covered walkway bordered by lotus ponds with Koi fish; all draped in a hanging garden of green vines leading up to a serene seated stone Buddha set against a cascading waterfall. The bedrooms and living spaces of the 4 bedroom showcase beautiful fine art paintings and limited-edition litho prints by some of Indonesia's best-known artists. Each bathroom features a stone relief carving detailing different aspects of the main temple carving inside the main gate. The walled garden and graceful interiors offer an abundance of space, natural light and separate places to relax. Children can enjoy a BOSE surround sound movie on the 48" flat screen TV in the entertainment pavilion while one group of adults enjoy some reading in the living room, and another group of adults lounge, surf the internet or watch sports on the 45" flat screen TV in the garden 'bale'. The pool deck is punctuated with big pots of flowering lotus. The interiors of the villa have been lovingly furnished, accented with colour and completed with delightful attention to detail. 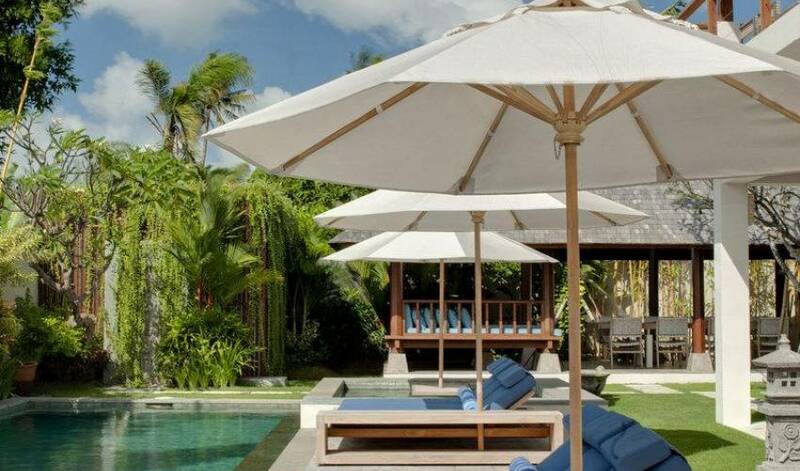 The owners have made every effort to employ 'Green Friendly' technologies in the construction of the villa including low energy lighting and a combination of solar and low energy convection water heating systems. Similarly, with the exception of certain high end imported fittings and equipment that were not available in Indonesia, every effort was made to use local materials and craftsmen. 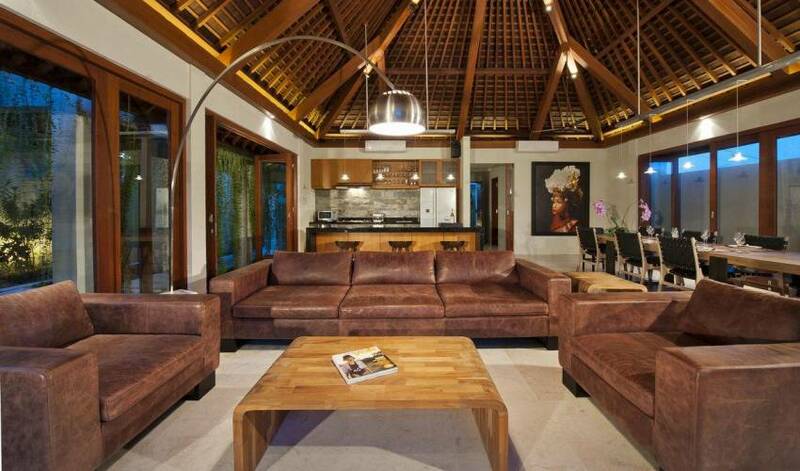 All furniture was locally made in Bali and Java. There are four bedroom suites with polished teak floors and cabinetry in the two-storey sleeping pavilion. Three are furnished with king size beds and one with twin beds (which can be put together with a specially designed top mattress). 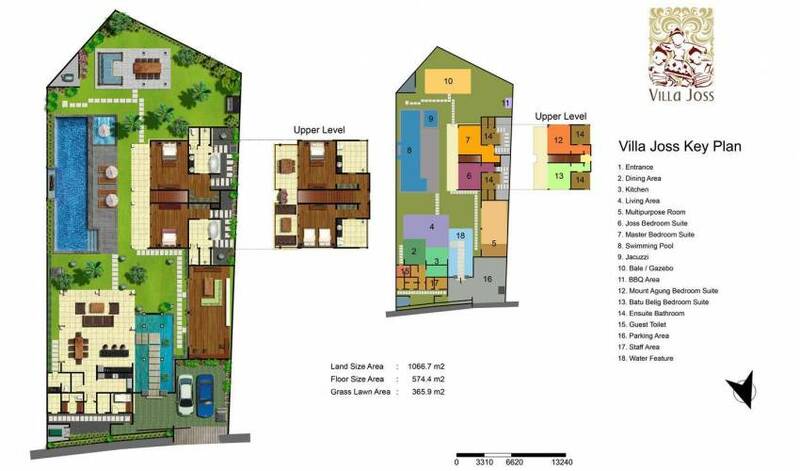 Each has an ensuite bathroom, as well as a spacious dressing area with plenty of hanging space. Each bedroom is equipped with a 42” satellite-channel flat screen TV plus a DVD player (upon request), air-conditioning, ceiling fan, safe deposit box and WiFi internet connection. The bedroom walls are adorned with beautiful original paintings by famous Indonesian artists as detailed under the heading “The Art & Artists”. The air-conditioned living and dining pavilion is framed in a soaring timber-lined roof with beautiful exposed beams and exquisite natural woodwork, three ceiling fans, a marble floor and folding wood framed glass doors on three sides that can be opened to invite the garden indoors. The room is furnished with a massive deeply cushioned leather sofa, two matching leather armchairs and a stainless steel arched reading lamp. On the opposite side is a 3.6 metre dining table for ten which is lit by elegant green glass and cast aluminium pendant lamps. 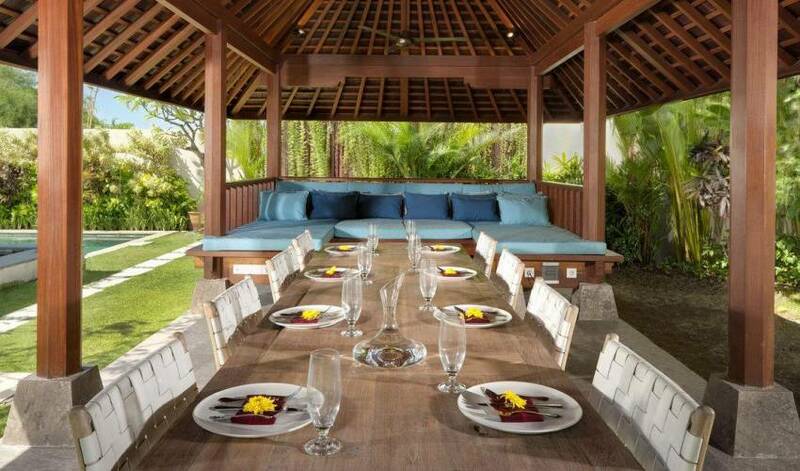 The table is made of teak recycled from old buildings in Java along with the teak and black leather strap dining room chairs. The ambiance of the living and dining pavilion is enhanced by the BOSE sound system. The air-conditioned multipurpose room features a high open ceiling with beautiful exposed beams and natural woodwork, a BOSE surround sound home theatre, play area for children and business centre. It is finished with a polished teak wood floor, a trio of blue hand-blown glass lanterns, and folding wood framed glass doors. One half of the room is fitted with an L-shaped built-in recycled teak wood desk that runs along two walls, equipped with plenty of electricity sockets so that guests can plug in their laptop computers and make use of the WiFi internet connection. The other side of this spacious room is furnished with a large comfortable L-shaped sofa and a long floor to ceiling shelf unit full of magazines, books and local artefacts. The multipurpose room is equipped with a 48” satellite-channel flat screen TV, DVD player and BOSE digital sound system. 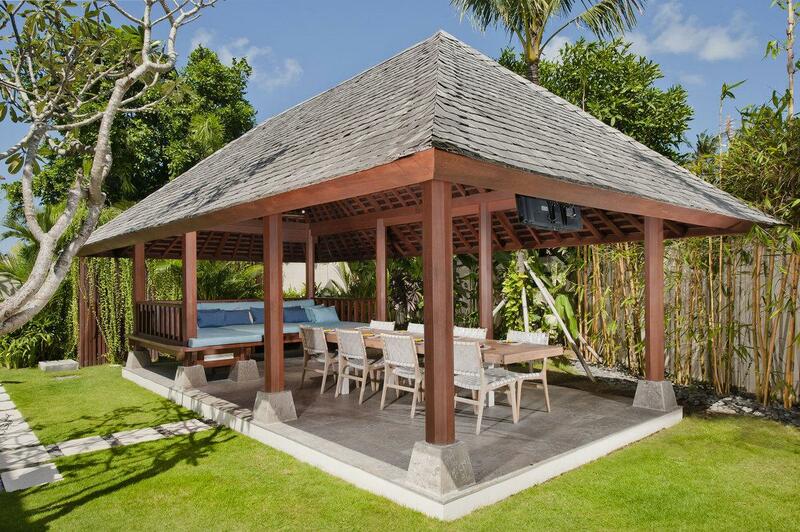 The Mount Agung Suite is the upstairs master, with a teakwood floor, a green theme, and sliding glass doors that open onto a delightful shared balcony offering big sky views of Bali's carefree kites flying over the treetops. The section of balcony immediately outside the bedroom is furnished with a table and four chairs, making it a lovely spot for breakfast. The room has a king-size bed with matching cushioned bench, side tables with white woven aluminium bedside lamps and is equipped with a 42” satellite-channel TV. The “Odalan” oil painting on the wall by Atjeng, features a colourful Balinese beachside ceremony – much like those guests can enjoy during their stay in Bali. There is also a large dressing area with plenty of hanging space. The Batu Belig Suite is also located upstairs, accented in gold and copper, with a teak wood floor and sliding glass doors that open onto the shared balcony. The balcony is furnished with a comfy upholstered sofa and chairs, and offers views of the greenery and rooftops of Batu Belig village. This bedroom offers the facility of twin beds (which alternatively can be joined with a specially designed top mattress) and a 42” satellite-channel TV positioned on a matching dark wood cabinet. The “Ke Pura” oil painting by Maria Tjui features a beautiful Balinese temple ceremony. There is also a large dressing area with plenty of hanging space. All four spacious ensuite bathrooms are fashioned in non-slip marble floors with matching polished marble walls. All are fitted with walk-in monsoon showers, large washbasins on polished black granite vanity units (twin washbasins on the ground floor) and large format toilets. Each of the two downstairs bathrooms feature a spacious indoor section with floor to ceiling glass walls looking out to a private outdoor garden shower area. Each of the downstairs bathrooms also feature a huge bathtub carved out of a solid block of marble, as well as two showers – one indoors with views of the private garden, and one shower under the sky in the open-air garden courtyard with high walls for privacy and a pebbled floor planted with heliconias and giant taro. 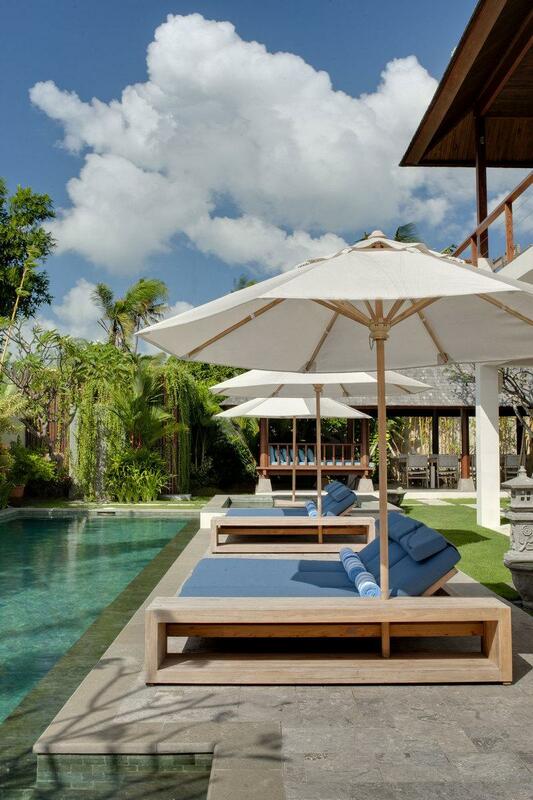 Since the villa opened in 2010, the Batubelig area has undergone some major development in the way of new small boutique hotels and private villas. As a result, Batubelig has flourished as an independent shopping and dining haven, with an abundance of small fashion boutiques, homeware stores, money changers and jewelry shops dotted along the road from the beach all the way to Petitenget. An ATM is conveniently located within 2 minutes walk, as is a 24hr convenience store. There are plenty of simple warungs (eateries) within easy walking distance of the villa and it is just down the street from the famous Métis fine dining restaurant, as well as newcomers Pavilion Bar and Grill and Slippery Stone Bar and Restaurant. The popular Seminyak barbecue rib house Hog Wild in Bali is also close by.